A juvenile alligator greeted us as we entered the trails of Grassy Waters Preserve. He was no more than three feet — still very small, but no longer a baby. Being very cautious and in extreme-defense mode due to his size, he was quite flighty. But I did manage a shot or two of this adorable guy…. 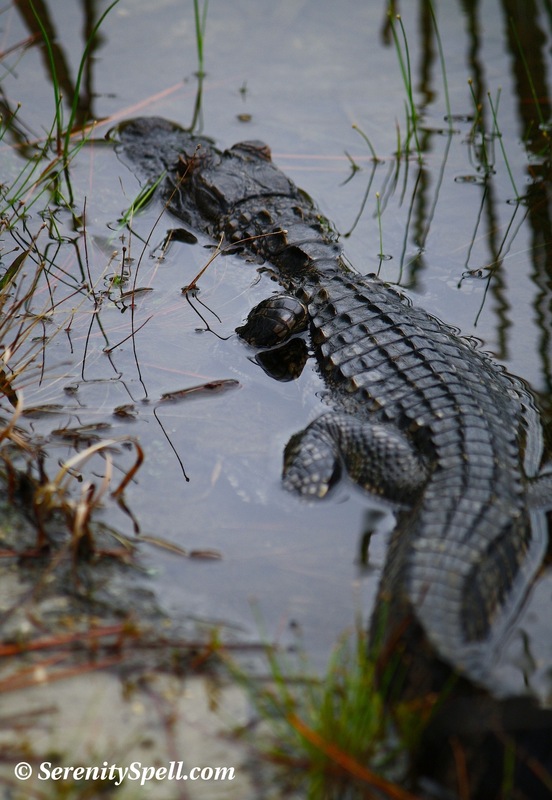 Juvenile Alligator: Slow Movements, Sloooowww…. Hee! I find them so photogenic, so primeval — I can’t resist! When you’re around them as much as we are, a certain level of understanding and respect is definitely reached. Too close for comfort! Great shots. My hands would have been shaking. Thanks so much! They’re definitely something to be aware of on certain hikes, around here… But honestly, like most wildlife, they don’t want to be around us. They’re just as scared of our presence! They’re amazing critters, though. They’re such fantastic predators… Years of understanding and respect have made me love them! Good images of a difficult subject, also enjoyed the frogs. Thanks so much! I love our gators — especially when they reach this size. And the frogs… Well, I become hyper-excited whenever I see one, so I’m just thrilled this one didn’t leap before I snapped! I always find it amazing that any creatures have survived from their origins… these are surely reminders of that. Good shots! Aren’t these animals amazing, if only for this reason? Twenty million years on this planet, with little to no change… It’s simply mind-blowing. They’re truly beautiful, and despite people’s fears, really want nothing to do with us (like most wildlife). Great photos! I love seeing them. Have you ever watched “Gator Boys” on TV? If you like gators that’s a great show to watch. I don’t think they produced too many episodes though. 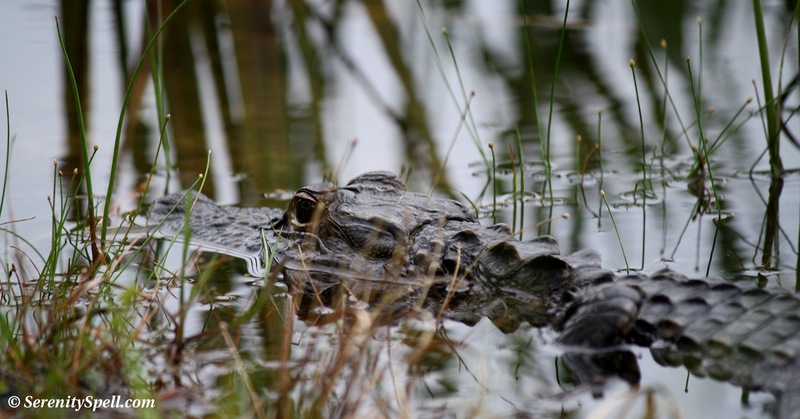 The Florida Everglades is actually the only place in the US where alligators AND crocodiles exist side-by-side… We’ve seen a few crocs in the ‘Glades, and it’s an odd sight for sure. But I’m sure they don’t get anywhere near the size of crocs in other countries. Thanks so very much for your kind words! I happily embrace (though not literally) our prehistoric friends. Heh heh….! DITTO! I really do love, admire, and thoroughly respect them. Oh, I completely understand! COMPLETELY! The gators are by far my favorite part of the hikes down here… I just adore them. They’re such misunderstood, beautiful creatures — as most native Floridians realize. 🙂 I’m happy to share them all with you!! I have *plenty* of images and posts devoted to them, hee! Your blog is ridicuously good!